The Polliwogs is holding a photo contest from now until April 20th in which you could win great prizes, including a month's unlimited free entry to the Polliwogs as well as S$100 Toys'r'us voucher. 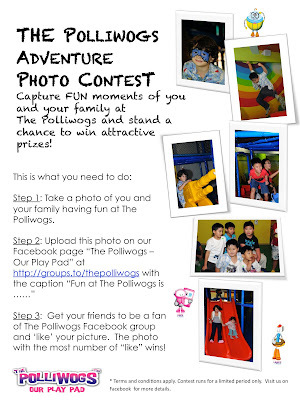 All you have to do is take some photos of your families' fun moments at The Polliwogs and upload them to the Polliwogs Facebook Fan page at http://groups.to/thepolliwogs . Invite your friends to become fans of the Polliwogs Facebook page and get them to 'like' your photo. The photos with the most 'likes' win one of three great prizes! The three winners will also be featured in the June issue of Today's Motherhood e-magazine. We visited The Polliwogs the other day and were pleasantly surprised by the friendly and relaxed atmosphere of this children's play centre. The ball volcano and shooting area seemed to be the most popular play area and I must say the parents looked like they were having just as much fun helping collect the balls to feed into the volcano. The 'chill out area' was busy with toddlers and their parents, with babies taking naps on sofas and in prams and families enjoying the convenience of the on site cafe. The cafe has made a real difference for visiting families. No longer do you have to visit one of the neighbouring food outlets. The cafe has something for everyone and is full of kid-friendly snacks. Some are not the most healthy, but you can choose from pies, pizza, nachos, potato wedges, sandwiches and chicken nuggets, vegetarian samosas, and fish fingers. There are also some great tasting smoothies, freshly squeezed fruit juices and teas and coffees for the adults. The other change to The Polliwogs is the outdoor bouncy castle which is no longer the pirates' ship but a covered house which is fine to use during the heat of the day. Unfortunately it was raining when we visited so it was deflated, but I'm sure the little ones will get more use out of this covered 'bouncy castle'. Wee Care now run their Parent-Toddler Playgroup and Bright Starts Programmes out of the three spacious party rooms during the week, so kids' birthday parties are only being booked on the weekends. The Birthday packages start from SG$488 for up to 10 children, and you can download all the information at the Polliwogs website. Children 2 years and above $16 for unlimited play. Children less than 2 years old $8 for unlimited play. Children 2 years an above- $18 for 90 mins of play, $8 for additional half hr or part thereof. Children less than 2 years old- $8 for 90 mins of play, $3 for additional half hr or part thereof. Additional charge for use of outdoor bouncy is $4 for both age groups, weekends and weekdays. Value pass is at $98.80 for weekends/weekdays, approx 8 visits.